I truly believe that in one of my past lives I was a Celtic warrior. Just like in Braveheart. What else would explain my affinity for the frenzied fiddling at the Dubliner in D.C.? Entranced by the Irish dancers at the Festival of Nations? That’s the only way to explain it. It just comes from within, this innate sense of je ne sais quoi with regards to the Emerald Isle. I laugh at those Capital One credit card commercials with the Viking looking, vague Brit accented dudes and their brutality. Deep down I get it. That was me! I shiver when I hear bagpipes, but in a good way. I feel nationalistic all of a sudden, but to what nation? I don’t feel this way as the date nears the 17th just because I am –like everyone else –bombarded with all things green. Noooo, not me. I don’t fall for those gimmicky holidays that are just an excuse to spend money, get drunk, put on a sombrero or buy some stale chocolates in a fuzzy heart shaped box. I tend to stay away from those things, and FAR away as I possibly can. St. Patrick’s day, however, is a bit different. It always depends on where I am. When I lived in Washington D.C. in my younger years, the place to be was the Dubliner. Oh, the times to be had there, green beer and all. Hangovers the next day at work were the norm. At that time, nothing mattered, not even (dare I say?) the beer. Not even the beer. I can’t believe I’m even typing these words now, but it was true. While my love for beer began as a seedling, my deep appreciation and affection for the simplicity and complexity that it possesses did not truly begin until much after my D.C. days. In Miami, celebrating St. Patty’s day was a completely different animal. South Beach has The Playwright, and while I never visited it on the 17th, I can say that this was one of my favorite pubs in South Florida. My outings in Miami on SPD were usually in Coral Gables, where one of the most uptight communities closed down the streets and partied hard. Beer a-flowing, bands-a playing, and young Cubanos a-drinking. Somehow it didn’t feel authentic. Could it be the 85 degree weather? The Spanish language spoken all over the place? The people dancing salsa to a pseudo rock band? I don’t know, and I really don’t care. I had a blast though, and it was all about the Smithwick’s and the amigos who were all Irish for a day. This year, I am in Syracuse, New York, which holds one of the largest St. Patrick’s Day Parades in the country due to its large Irish-American community. I grew up with it, and even had a brief stint as a flute player in my high school marching band, pseudo-playing around the parade route. My fingers were too cold to actually play, and I knew the trumpets and trombones would take over the songs anyway. Unfortunately, I will not be able to attend this year’s event, but will be there in spirit. To commemorate St. Patrick himself, I may go to Coleman’s. Or to Kitty Hoynes. Perhaps I’ll have a delicious Beamish at the Limerick Pub. There are so many wonderful Irish pubs to choose from in Syracuse on any given day, not just the 17th. I make no excuses to go out and have a beer, and I don’t need one. We’ll see where the day takes me this year. 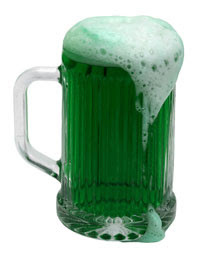 Who knows, I may just go home and quietly celebrate by making my own green beer and dream of the days of my warrior past and think about my next beer conquest. *Update 3/9/11: A dear friend from Nova Scotia has informed me that “Braveheart is Scottish not Irish, Scots play the bagpipes not the Irish.” However, that “Scots are Celtic, but Saint Patrick’s Day is an Irish holiday. I am sure that the Scottish celebrate the day, they like to drink as much as the Irish, but the holiday originated in Ireland.” I should have checked Wikipedia. My bad. I’m with you Beer Girl. I started my career at a very young age drinking sips from my father’s perpetual stash of Blatz. Oh and the bottled beer in a can came next. To Natural Light at four dollars a twelve. My friends from Dayton tricked me into drinking Goebel for a time, only because of the prestige of the watery brew. Please don’t forget the Milwaukie’s Beast and its post day mess it made of you. I even had a Malt Liquor stint, colt 45 it works every time, Mickey’s Mean Green (my first Irish drink), St Ides (Wikipedia says a potent brand of malt liquor), Crazy Horse (pretty sure it was outlawed) and of course Old E (only on special occasions). From there it got a little boring, Bud, Bud light, Miller light….With age my taste has changed like a lot of you. I could say my pallet is more complex now, but no, I think I just burnt most of my taste buds on habanera peppers. No I need something a little bolder. I think I’m going to drink stout this St Patty’s day, preferable a nice full, creamy, and smooth Russian imperial. Roasted barley please! I want to chew on my beer a little this St. Patty’s day.